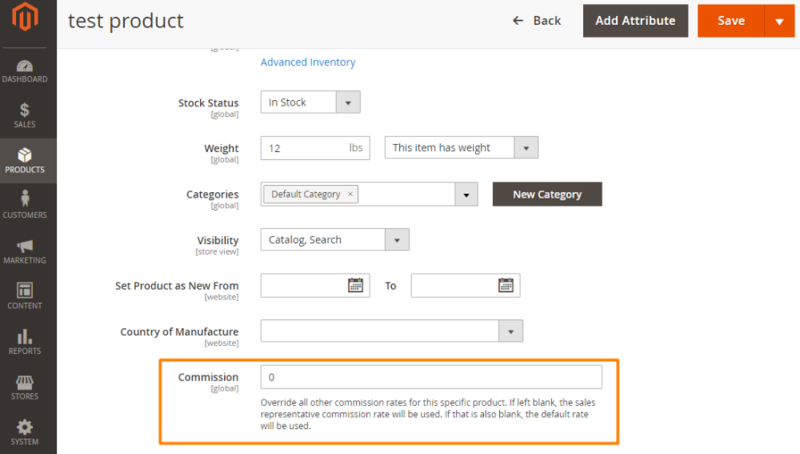 With the Sales Rep Commission Manager Extension is possible to assign specific commission rates to individual products. This allows you to incentive representatives to sell particularly profitable products (either permanently or temporarily) and also prevents you from losing money on products with tight margins. Once a commission rate is changed, past orders will not be affected. If you do not wish for a product to have a special commission rate, you can simply leave it blank and the default commission rate will be used. In order to apply the commission for an individual product, please go to PRODUCTS → Catalog, select the product you wish to modify and input the custom commission rate you wish to use on the 'Commissions' field. Finally, remember to click the button Save to apply your changes.